A bomb exploded Tuesday near a U.S. military vehicle on a road in central Afghanistan, wounding four American troops and their Afghan interpreter, the U.S. military said. None of the injuries appeared to be life-threatening, and U.S. aircraft were sent to the scene to transport the wounded to a hospital, said spokesman Lt. Col. Jerry O'Hara. The attack occurred during a routine patrol in support of an ongoing operation south of Ghazni, south of the capital, O'Hara said. "Terrorists, who often pay impoverished Afghans to detonate these devices for them, are behind these brutal attacks," he said. "These criminals know they cannot stand up to Afghan and coalition forces, so they are forced to resort to these tactics." On Monday, a suicide bomber wounded four U.S. troops in an assault on an American military convoy just west of the city. O'Hara said three bombs were discovered and destroyed in other locations Monday. Meanwhile, Afghan and U.S.-led coalition forces killed two suspected insurgents and captured 13 others in a firefight in southern Afghanistan, the U.S. military said. The clash occurred Monday after the 15 rebels were spotted walking through a narrow valley just north of Kandahar, the main city in southern Afghanistan, a statement said. 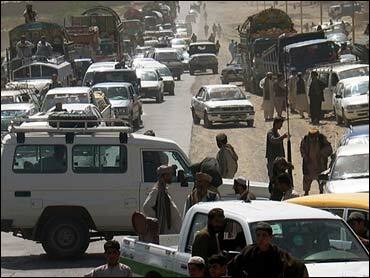 One of the 13 arrested was wounded in the fighting and was taken to Kandahar for treatment, it said. Also on Monday, police in Kandahar arrested an alleged local Taliban commander, Mohammed Eisah, who is suspected of involvement in the killing in May of Abdul Fayaz, a top cleric in southern Afghanistan, as well as the assassination last year of a regional army commander, said police chief Gen. Hayub Salangi. He said Eisah was captured after a firefight near the city. In addition to Eisah, two Afghan men and two women were arrested at a police checkpoint near Kandahar after they were found to be carrying weapons and photos of Osama bin Laden and renegade former premier Gulbuddin Hekmatyar, said Salangi. Even though U.S. military commanders express optimism about progress toward making Afghanistan secure, there has been a sharp rise in bombings, shootings and other violence since winter's snow melted in mountain passes used by insurgents. President Hamid Karzai's administration has warned that Taliban-led rebels and al Qaeda militants are trying to subvert crucial legislative elections in September.